AT LEAST two homes have been destroyed, other properties damaged and hundreds of residents have been forced to leave their homes as an intense fire with 12m high flames burns out of control in central Queensland. The massive fire had torn through about 11,000ha of land by this morning, causing the evacuation of about 800 people. An emergency situation was declared yesterday by police, as officers, fire crew personnel, volunteers and SES workers spent hours going from door to door ensuring the people of Deepwater and Baffle Creek, located between Bundaberg and Gladstone, knew to leave. Gladstone Mayor Matt Burnett this morning said one property in the Deepwater area was "completely lost" and another was "30-40 per cent taken" by the fire, with a further three properties affected and multiple sheds as well. The Queensland Fire and Emergency Services have since confirmed two homes have been destroyed. Firefighters this morning said "many properties are still potentially at risk". Mr Burnett this morning reiterated the need for residents of Deepwater, Baffle Creek and Rules Beach to evacuate now if they hadn't already done so. 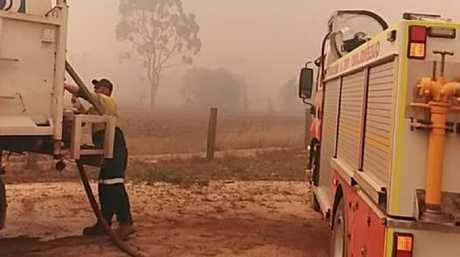 Conditions eased slightly overnight as fire crews battled to bring the fire within containment lines but conditions are expected to worsen again today as temperatures and winds increase. Assistant commissioner of the QFES John Watson this morning said while the winds were expected to ease slightly it would be "hotter and drier … we're expecting another difficult day". 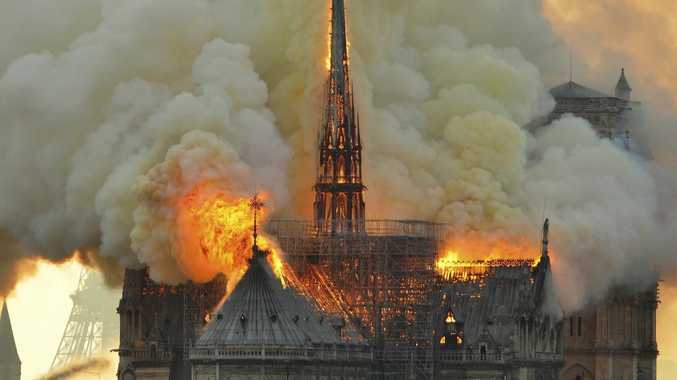 He said the fire had been "extremely difficult" to fight. "It's been a very difficult three days for us, since Friday, with the weather not abating at all." He said the fire was travelling north and encouraged residents of Agnes Water and 1770 to keep up to date with conditions and take precautions if need be. Authorities yesterday warned this blaze was not the "run of the mill fire" and urged residents not to be complacent. They described it as "dangerous and unpredictable" and warned it could have a "significant impact on the community". Last night, the unpredictable fire was travelling in a south, southwesterly direction and was impacting the Deepwater community. 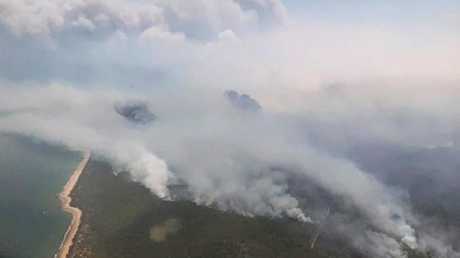 Predicted strong winds were expected to fuel the blaze into the late evening. One Deepwater resident described the fire as "horrific". "Everything was just red, it was so red," they told media. "My clothesline, probably 100m away from my backdoor … I couldn't even see my clothes line. "We knew the fire was right on us, we could hear it, we could see it. Then all of a sudden my phone went off and it said 'Evacuate Now'." A QFES spokesman said if the conditions eased throughout the night, fire crews would work to put containment lines in place using machinery in anticipation for this morning. Police have advised Wartburg State School at Baffle Creek is closed due to the blaze. Premier Annastacia Palaszczuk described the blaze as "unusual for Queensland" and warned the "worst is not over". "The intensity of this fire covers some 9000ha and the flames are more than 10 to 12m high," she said. "We expect this to be happening for a few more days, but it is very important that all residents take this issue extremely seriously. "I urge all families to look after one another and please evacuate immediately." QFES Commissioner Katarina Carroll said about 600 people were expected to evacuate from the Deepwater Creek community, as well as an additional 200 residents from nearby Baffle Creek. At least 100 fire officers were on the ground yesterday, accompanied by 42 trucks and six aircraft. "This really is a very unusual fire," Ms Carroll said. "We have not seen this in this part of the world before."